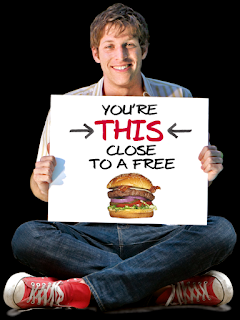 Get a big, juicy, need-3-hands-to-hold, Jack Daniel's Burger from TGI Friday's - for free! You're already THIS close to it. All you have to do is hop on your Facebook account and "Fan" Woody. That's it. Then the coupon is yours. With the football season officially kicked off, this coupon is the perfect time to make a trip to TGI Friday's and enjoy a succulent burger while you're watching a game of football. Hurry up, log in to Facebook and Fan Woody. And if you're not on Facebook (and missing out on great deals like this), register here. Check out the rest of TGI Friday's menu here.